2014 marks the 100th anniversary of Yakov Borisovich Zeldovich who was born in Minsk, Belarus on March 8th 1914. On March 10-14, 2014 an international conference in honor of Ya. 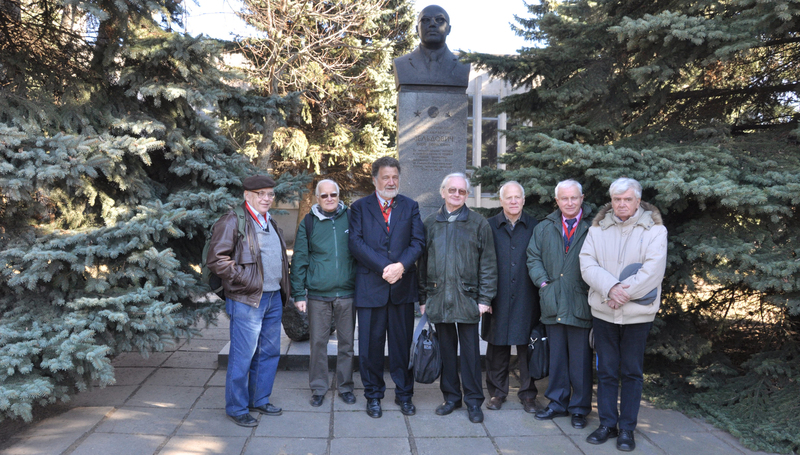 B. Zeldovich 100th Anniversary was held in Minsk, Belarus, see: http://www.icranet.org/zeldovich2014. The conference was jointly organized by ICRANet and the National Academy of Sciences of Belarus. The opening address was given by Nobel Laureate prof. Zhores Ivanovich Alferov and by Prof. Remo Ruffini. There were about 90 participants from Argentina, Armenia, Belarus, Brazil, China, Germany, Italy, Kazakhstan, Poland, Russia, and other countries. The conference covered many topics including cosmology, relativistic astrophysics, general relativity, elementary particle and nuclear physics, detonations and explosions. Plenary talks will appear as regular articles in the refereed journal Astronomy Reports. Proceedings of the conference will be published by the National Academy of Sciences of Belarus. This celebration was the second international conference in Minsk dedicated to Ya. B. Zeldovich. The previous meeting was held on 20-23 of April 2009 and was organized jointly by ICRANet and Belarusian State University and celebrated also the 2009 Year of Astronomy. 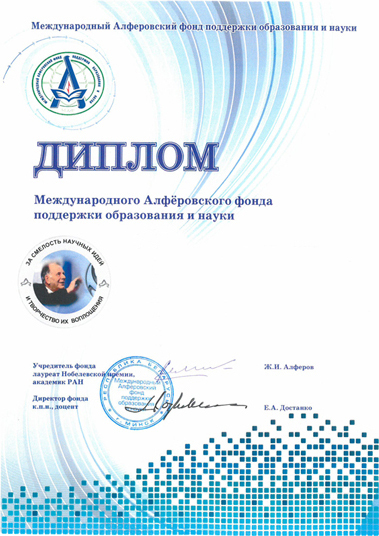 "Defining multipole moments of neutron stars from QPOs" Six diploma from Foundation for support of education and science (Alferov's foundation) were awarded for best talks given by young scientists. Five of them went to participants from ICRANet. 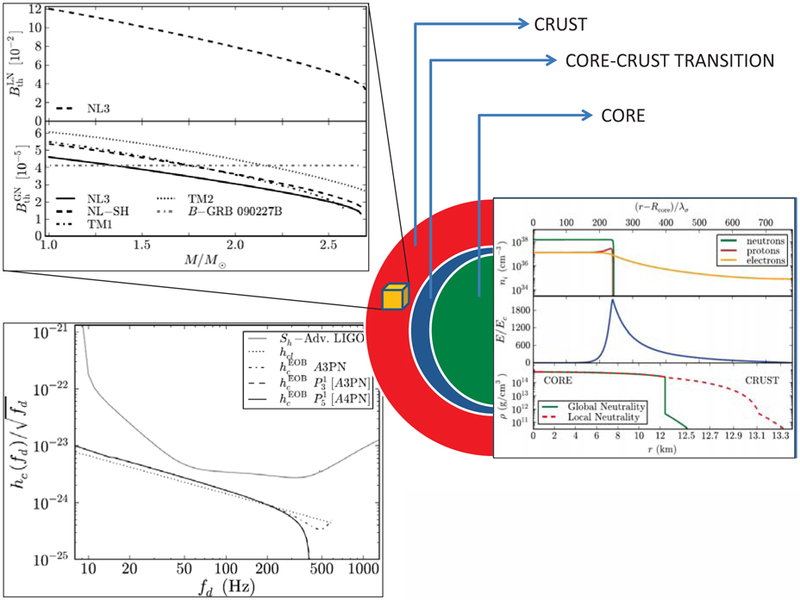 "Innermost stable circular orbits of spinning particles in Schwarzschild and Kerr metric"
"Gravitational waves vs. X and Gamma rays emission in a short gamma-ray burst"
"On the Binary Driven Hypenovae and the nested properties of their X-ray afterglows"
"GRB 130427A and SN 2013cq: Multi-wavelenght Analysis of An Induced Gravitational Collapse Event"
The data obtained from the electromagnetic spectrum of GRB 090227B allowed to probe crucial aspects of the theory of neutron stars, their equation of state, and to estimate the gravitational wave emission versus the electromagnetic output in X and gamma-rays in a short GRB, produced in the merger of a binary neutron star. These results, which are currently in press in The Astrophysical Journal, have been recently obtained by Fernanda Gomes Oliveira, Ph. D. student of the IRAP PhD Program with a grant of the Erasmus Mundus Program, under the supervision of Profs. Remo Ruffini and Jorge A. Rueda. These results worthed an award to Fernanda by the Alferov foundation, in the conference organized by ICRANet and the National Academy of Sciences of Belarus in honor of Ya. B. Zeldovich 100th anniversary, held in Minsk in March 10-14, 2014. The baryon load estimated for GRB 090227B, shows a remarkable agreement with the amount of matter expected to be ejected in the merger of a neutron star binary with components described by the theory of neutron stars developed by our group, which takes into account the strong, weak, electromagnetic and gravitational interactions within general relativity and satisfy the condition of global charge neutrality [Belvedere et al. Nucl. Phys. A (2012,2014)]. The dynamics of the binary was computed up to 4th Post-Newtonian order with the effective onebody formalism of Prof. Thibault Damour. From the dynamics, it was obtained that the electromagnetic emission in the X and gamma-rays is much larger than the gravitational wave emission in the entire life of the binary including the last plunge. It was also addressed the issue of the detectability of GRB 090227B, located at a cosmological redshift z = 1.61 [Muccino et al. ApJ (2013)], by the Advanced LIGO interferometer. A signal-to-noise ratio, SNR=≈ 0.32, integrated up to the merger point, was obtained. This value is much lower than the needed for a positive detection, e.g. SNR=5 or higher. It was also estimated the redshift at which this GRB with a SNR=5: z ≈ 0.09, or a luminosity distance to the source dL ≈ 381 Mpc. Unfortunately, in the last 40 years, no such a close GRB has been observed. 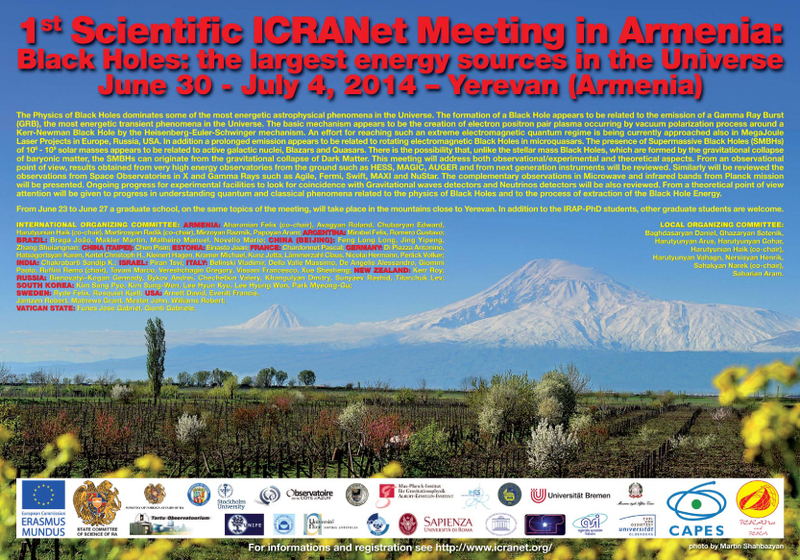 The meeting will be held in Yerevan from 30 June to 4 July 2014 and will address both observational/experimental and theoretical aspects. From an observational point of view results obtained from very high energy observatories from the ground such as HESS, MAGIC, AUGER and from next generation instruments will be reviewed. Similarly will be reviewed the observations from Space Observatories in X and Gamma Rays such as Agile, Fermi, Swift, MAXI and NuStar. 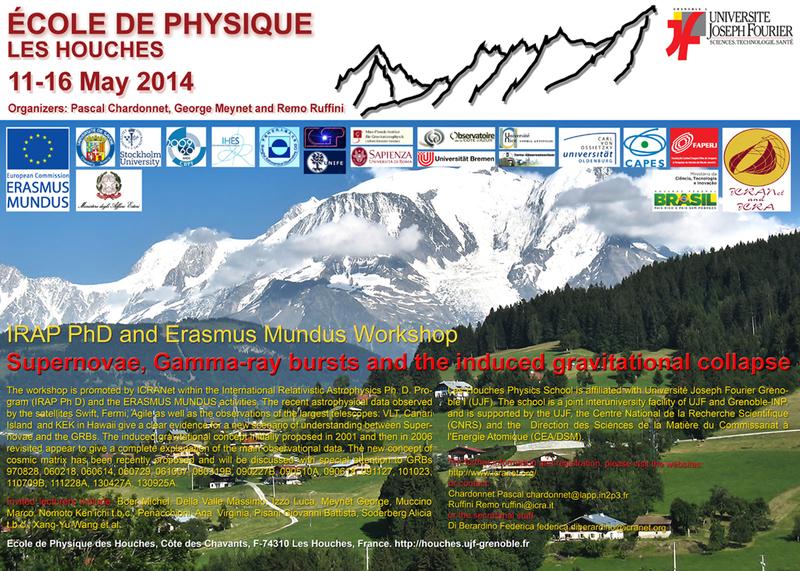 The complementary observations in Microwave and infrared bands from Planck mission will be presented. Ongoing progress for experimental facilities to look for coincidence with Gravitational waves detectors and Neutrinos detectors will be also reviewed. From a theoretical point of view attention will be given to progress in understanding quantum and classical phenomena related to the physics of Black Holes and to the process of extraction of the Black Hole Energy. In addition there will be a summer school prior to the meeting (from June 23 to June 27) in the mountain town of Aghveran, on the same topics of the meeting.